is the classical radius of the electron. This is the name given to a combination of fundamental physical quantities (e2/mec2 in cgs units) that has the dimension of length. Further, we see from (1) that re is indeed very close, within a factor of (8/3)1/2 of behaving exactly like the radius of the bull's-eye target the photon must strike if it is to be scattered by this process. X-ray scattering from atmospheric molecules in a room near an x-ray generating machine is an example of Thomson scattering. Most of the electrons involved are the outer electrons of air molecules, and their binding energies are much smaller than the incident x-ray energy. The white diffuse nebulosity surrounding the sun during a total solar eclipse is another example of Thomson scattering. Sunlight is Thomson-scattered by the free electrons in the ionized gas of the million-degree solar corona. Since the scattering probability is independent of photon frequency, the scattered light is white like the source of the light (unlike the Rayleigh scattering off air molecules). Thomson scattering is also important in accreting x-ray sources where a plasma of protons and electrons is falling onto a compact neutron star. The rate of descent of this plasma may be slowed or even stopped by outgoing x rays that interact with the electrons in the plasma via Thomson scattering. Since it is the infall energy of the plasma that gives rise to the x rays, this leads to a maximum x-ray luminosity, the Eddington luminosity. If the photon energy is very high (in this context), approaching the rest-mass energy of an electron, hv ~ mec2 = 511 keV, the probability of scattering from free electrons begins to decrease rapidly with frequency. This high-energy extension of Thomson scattering is called Compton scattering. In this regime, the photon will transfer a considerable portion of its momentum (and energy) to the electron, and the balance is carried off by the scattered photon. The cross section gradually decreases from its low-energy value, aT, toward zero. (Look ahead to Fig. 6c.) The energy of the scattered photon varies with the scattering angle, just as a baseball does when it hits a bat. This variation can be calculated by conserving energy and momentum in a relativistic calculation. The threshold for this process suggests that it is applicable only to gamma-ray astronomy. However, inverse Compton scattering is important in many branches of astronomy. In this process, high-energy electrons interact with lower-energy photons, boosting the photons to higher energies. For example, the energetic electrons in the hot plasmas known to exist in clusters of galaxies (from the observed x-ray emission) will scatter photons of the cosmic microwave background (CMB) up to higher energies and into different directions. The CMB radiation photons passing through the cluster en route to an observer will, with a low probability, be so scattered. Low-energy photons will be removed from the direction of the observer while photons initially traveling in some other direction will be scattered into it with increased energies. An astronomer observing the CMB in the direction of a cluster of galaxies will thus detect a slightly reduced intensity of low-energy photons and a slightly increased intensity of high-energy photons compared to view directions with no cluster in the line of sight. In other words, the blackbody spectrum of the CMB (Fig. 11.9b) is slightly distorted. It is not an apparent increase in the temperature of the CMB because increasing the temperature of blackbody radiation raises the intensity at all frequencies (Fig. 8b). This distortion of the CMB spectrum in the direction of clusters of galaxies is known as the Sunyaev-Zeldovich effect. The CMB pervades the entire universe and has a thermal temperature of only 2.73 K; it is presumed to originate in a hot early phase of the universe and has since cooled to this frigid temperature. All the stars and planets are embedded in a sea of photons, each with a tiny energy, on average, of EVy av = 6 x 10-4 eV. (For blackbody radiation, EVy av = 2.7 kT; see (2.13)). A high-energy gamma ray will interact with a CMB photon to create an electron pair only if there is sufficient energy (2mec2) in the center of mass to create the particles. This requires energies in the "laboratory" frame of reference approaching 1015 eV (1 PeV). Consider a gamma ray above the 1-PeV energy threshold. The cross section for a pair-production interaction is so large that it has only an e-1 = 0.37 probability of surviving a journey of 26 000 LY. Since the center of the Galaxy is about 25 000 LY distant, even galactic astronomy is somewhat compromised, and extragalactic astronomy is out of the question. This discussion might make it appear that our universe is quite transparent below the threshold, e.g., at —1 TeV = 1012 eV. Unfortunately, this is not true because the expansion of the universe causes photons traveling within it to be gradually reddened. Thus the gamma rays and the CMB photons were all of higher energies in times past. Gamma rays originating at great distances from the sun started their journey at these earlier epochs. Thus they could well have found themselves above the threshold for pair production. It turns out that a 1-TeV gamma ray detected at the earth is not likely to have originated more distant than redshift z ~ 8; see (9.31) for definition of z. Emission at z ~ 8 would have taken place when the universe was only 1/(1 + z) = 0.11 of its current "size". 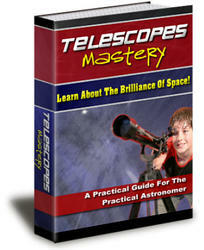 Earlier phases of the universe are thus not accessible to 1-TeV astronomy. At this writing there is some speculation that 1-TeV gamma rays might have a substantially shorter range because of a diffuse extragalactic infrared background that could be due to bursts of star formation in the early formation of galaxies (star-bursts). It is difficult to measure such a background directly. The study of gamma-ray spectra from gamma-ray-emitting galaxies is a probe of such a background. Photoelectric absorption and absorption lines An important example of the attenuation of a photon beam in astrophysics is absorption by the hydrogen atoms in interstellar space. In such an interaction, the photon is completely absorbed by the atom and ceases to exist. The converted photon energy can excite the atom to a higher energy state if the photon has exactly the correct energy for the transition. The energy levels of hydrogen and some of the transitions are shown in Fig. 1. This is called a bound-bound transition. Such absorption will give rise to absorption lines in the spectrum of the detected radiation. A photon without the correct energy to effect a bound-bound transition will not interact and will proceed unimpeded unless it has sufficient energy to ionize the atom. In this event, it completely ejects the electron from the atom. This process is called a bound-free transition, or photoelectric absorption. Part of the photon energy goes into overcoming the potential (ionization) energy, 13.6 eV for ground-state hydrogen, and part goes into the kinetic energy of the ejected electron. We first encountered photoelectric absorption in Section 6.2 in the context of the photomultiplier tube and proportional counter. It is discussed further in Section 5 below. We will encounter atom-photon interactions again in Section 11.3 in the context of continuum spectra. Finally we note that a molecular system can similarly absorb photons via ionization and excitation as well as by being split apart, dissociation. When a photon is absorbed by an electron or atom (photoelectric absorption), a portion of the energy may be re-emitted by the atom in the form of spectral lines that can be measured from the earth. Dramatic examples of this are the HII regions in the vicinity of newly formed and very hot stars. Energetic ultraviolet photons from these stars can ionize all of the hydrogen in a large region surrounding the star (a Stromgren sphere or HII region). Figure 10.1. Energy levels of the hydrogen atom. Downward transitions (e.g., the Balmer transitions shown) give rise to emitted photons that can be observed by astronomers. 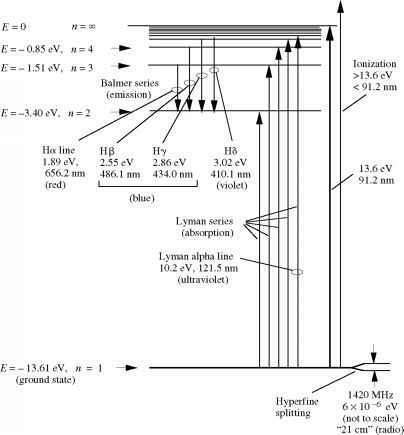 Upward transitions between levels (e.g., the Lyman series shown) are caused by absorption of photons of the appropriate energy E = h v. The atom can be ionized from the ground state by absorption of a photon of energy E > 13.6eV (wavelength X < 91 nm). The minuscule hyperfine splitting of the ground state is shown with greatly exaggerated spacing; downward transitions between these levels give rise to the 1420-MHz (21-cm) photons observed by radio astronomers. In a region of ionized hydrogen, a proton and an electron occasionally pass close to one another and recombine to become a neutral hydrogen atom most likely in an excited state. The decay to the ground state leads to the emission of the radiation in the form of emission lines at the frequencies characteristic of hydrogen. For example, the n = 3 to n = 2 Balmer transition yields a "red" optical photon at wavelength X = 656.2 nm (transition shown in Fig. 1). It is known as the Ha line ("H alpha line"). The characteristic red radiation seen in color photos of H II regions, e.g., the Trifid nebula and Orion nebulas (Figs. 1.5 and 1.6 respectively, in grayscale) is this Balmer radiation. Pair production near a nucleus Photons of energies > 10 MeV (gammarays) that pass close to an atomic nucleus will interact with the electric field and spontaneously convert to an electron-positron pair. This is known as pair production. 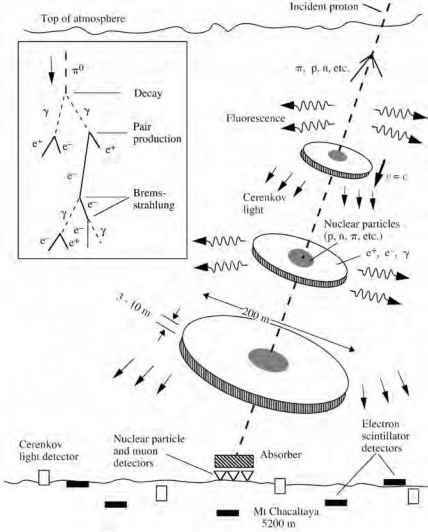 The process is fundamentally the same process as that discussed above (3); the electric field of the nucleus consists of virtual target photons. The created e-e+ pair will propagate in the forward direction with most of the original energy; see the sketch of the EGRET gamma-ray detector, Fig. 6.5. The probability that pair production will occur in a given interaction increases rapidly with energy. Nevertheless, the numbers of nucleons are sufficiently small in interstellar space so that gamma-ray astronomy of the Galaxy and other distant galaxies is still viable. It is only at extremely high energies of >1015 eV that it becomes opaque due to the interactions with the CMB (see above).